Implants usually last a long time. When patients are missing all of their teeth, long-term studies (more than 30 years) show an 90 to 95 percent success rate. For patients missing one or several teeth, recent studies show a success rate of greater than 95 percent, which compares favorably with other areas in the body that receive implant replacement (such as hips or knees). However, if one of your dental implants either doesn’t heal properly or loosens after a period of time, you may need to have it removed. After the site heals (or on occasion at the time of removal), another implant usually can be placed. The dental work required to complete your treatment can be complex. Most of the work involves actually making the new teeth before they are placed. Your appointments are considered more comfortable and more pleasant than previous methods of tooth replacement. Frequently, this process can be performed without local anesthesia. Your restorative treatment begins with specialized impressions that allow your dentist to produce a replica of your mouth and implants. He/she will also make “bite” records to see the relationship of your upper and lower jaws. With this information, the abutments (support posts) that attach your replacement teeth to your implants, will be fabricated. If your final restoration is a removable denture, you may need to see your dentist for as many as five office appointments (although it may be fewer) over the following several months. During these appointments, your dentist will perform a series of impressions, bites and adjustments in order to make your new teeth, as well as the custom support bars, snaps, magnets, or clips that will secure your teeth to the implants. During this period, every effort will be made to ensure you have comfortable, temporary replacement teeth. In general, once your implants are placed, you can expect your tooth replacement treatment to be completed anywhere from 1 to 12 months. For these reasons, it is difficult for us to tell you exactly how much the restorative phase of your treatment will cost, although you should receive a reasonable estimate from your dentist’s office. It also is difficult to give you a specific time frame for completion of your treatment until after the implants are ready for restoration. 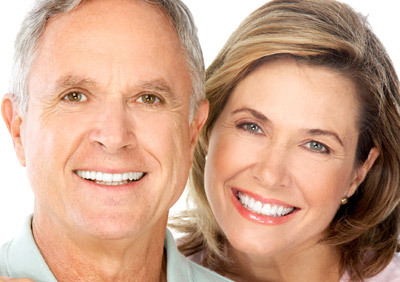 Dental Implants are the most technologically advanced and longest lasting tooth replacement option available. Restore your confidence… Smile, Eat and Enjoy! As with natural teeth, it is important that you clean implant-supported restorations regularly with toothbrushes, floss and any other recommended aids. You should also visit your dentist several times each year for hygiene instructions and maintenance. As with regular dentures and other tooth replacements, your implants and their associated components are subject to wear and tear and eventually will need repair, including clip replacement, relines, screw tightening, and other adjustments. Dr. Benson will place the implant(s) and perform other necessary surgical procedures. Your general dentist will provide the temporary and permanent replacement teeth. Both doctors are involved in planning your dental treatment. Also, depending upon a variety of factors, different dental specialists may help with your dental care.